This article is based on a alpha version of Angular 2 which is now obsolete. For an up-to-date tutorial, please see the article Angular 2 Tutorial: Create a CRUD App with Angular CLI. The current stable version of Angular (i.e, Angular 1.x) was built using the features of ES5 and was meant to work on most of the browsers, including some of the older versions of IE. The framework had to create a module system of its own, abstract away some of the language features, and provide a highly abstracted and configuration based interface to work on. All good things of Angular 1 are still available in Angular 2 but the framework is simpler. Angular 2 is built with features of ES6 (and ES7), Web Components in mind, and targeting evergreen browsers. In this article, we’ll see how to use Angular 2 and TypeScript to build a simple application. As Angular 2 is still in alpha, syntax of the code snippets shown in this article may change before it reaches the stable release. The code developed in this article is available on GitHub. Angular 2 was built with simplicity in mind. The team removed a number of recipes of Angular 1 that made us think “Why are we doing this?” (if you want to know what has been removed, I suggest you to take a look at this video titled Angular 2.0 Core session by Igor and Tobias). Now the framework is made of a small set of building blocks and some conventions to be followed. Components: A component is similar to directives in Angular 1. It is built with features of Web Components. Every component has a view and a piece of logic. It can interact with services to achieve its functionality. The services can be “Dependency Injected” into the component. Anything that has to be used in view of the component has to be a public member on the instance of the component. The components use property binding to check for changes in the values and act on the changes. The components can handle events and event handlers are the public methods defined in the component’s class. Services: A service is a simple ES6 class with some annotations for Dependency Injection. As in Angular 1, Angular 2 uses Dependency Injection to get references of the objects. As scope has been removed from the framework, we don’t have digest cycle running. Therefore, we don’t need to keep calling scope.$apply while working in non-Angular world. Angular 2 uses Zone.js to kick the changes and this library knows when to act. An Angular 2 application starts with a component, and the rest of the application is divided into several components which are loaded inside the root component. If you want to learn more about the basics of Angular 2, please check Victor Savkin’s blog post about Core Concepts in Angular 2. Angular 2 is still in alpha at the time of this writing, so the framework and the resources around it are still raw. They’ll go through a number of changes and will get better by the time it will be ready for production. There is a great number of seed projects to get started with Angular 2 and TypeScript. I think that this one by Elad Katz could be a good starting point to do some practice. To start, if you want to follow along with this tutorial, clone this repository. Then, follow the instructions mentioned in the readme file to install and run the seed project. contains source TypeScript files which are located inside the scripts folder while the public folder is used to store transpiled files. Now that you’ve an idea of what Angular 2 is and you have also cloned the seed project, let’s modify it. 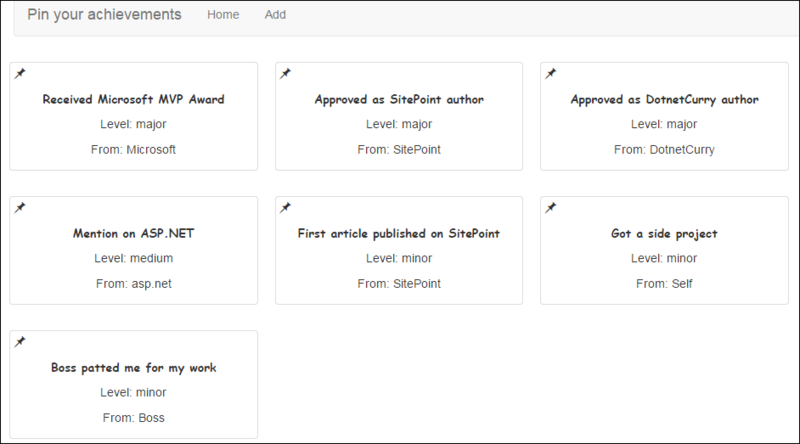 We’ll build a simple application to pin your achievements on a board. As the first thing, let’s add the Express APIs to get and add the achievements. As I forked the repository and modified the seed project to add basic Express APIs, you’ll see an endpoint serving the existing list of all the achievements. To post a new achievement, we need to add an endpoint. In the view, we need to create links for navigating between the pages. The router-link attribute component helps us in doing this. We need to assign the name of the component to the attribute and it’ll take care of building the link based on the path previously configured for the component. The final piece of the HTML code we need in the root component is a route-outlet element. This is the place where the child components will be loaded while navigating across the views. Now, let’s modify the home component to display a list of all the achievements in the form of pinned boxes on a wall. We’ll use Bootstrap to style this page. Bootstrap’s CSS is already loaded in index.html from a CDN. The methods of the Http class don’t return promises but observables. The latter are the objects that have built-in capabilities to notify when something changes. The home component needs an object of the AchievementsService and NgFor directive to retrieve and show the list of the achievements. Let’s save these changes and run the application. You’ll see the list of the achievements in the form of boxes. Forms can be created and managed in multiple ways in Angular 2. They can be template driven, model driven and data driven. Discussing more details of these approaches is outside the scope of this article, but in case you’re interested, in this project we’ll use the model driven approach. Though we won’t be using validation in this article, you’ll be happy to know that forms in Angular 2 also support validation. In model driven approach, we need to create a model object to be bound on the form and declaratively attach it to the form. The fields in the form are bound to the properties of the model object. The value of the model object is passed to the service to send it to the server. The property addAchievementForm on the class has to be used on the form. The properties of this object would be attached to the controls inside the form using ng-control directive. The method addAchievement uses the form model object to pass the value entered on the screen to the server and sends the user to the home screen once it receives a response. You may have noticed that we’re not handling error cases of the HTTP requests. That is because the feature is not yet available in the HTTP API, but surely it’ll get better in the future. In the above snippet, the parenthesis around ng-submit indicate that it’s an event. The function assigned to it would be called when the form is submitted by the user. The square brackets around the ng-form-model directive indicate the value is bound to a property of instance of the component. To conclude, save all the changes and run the application. You should be able to add new achievements now. Angular 2 embraces the current latest and greatest technologies of the front-end world. In addition, by using TypeScript to write code, it boosts up the productivity of the developers. As we saw, the framework is completely re-written and helps you in doing many things in a simpler way. As the framework is still in alpha, I suggest you to not use it in an application that is in production. Be patient and wait to see how the AngularJS team shapes its baby.